Muslin #2, Mrs. Mole's fix and MORE! I sliced across the back at yoke level, and swung the top half up to create a curve at the upper back. Simple. Also visible here is my forward shoulder adjustment, which I hope will move the seam closer to the apex of my shoulder. An equal amount was subtracted from the front shoulder seam to balance out the equation, so to speak. So this is the neckline of the Bill Blass suit that I made a couple years ago. Note the nicely curved lined where the front joins the back. Also see that the back shoulder is wider than the front, which is correct. How is this jagged line supposed to curve around anyone's neck? No wonder it won't fit! I've taped in a scrap of paper and drawn the missing curve. And while I'm tweaking things, I added a 1/4" to the lapel width (just a little too 60's narrow), and reduced the curve at the bottom edges of the jacket fronts, which seemed to "cut away" too much for my taste. (I think this was due to the high positioning of the buttons on the original). Much better fit around the neck, and across the upper chest. (You have to excuse my left arm, which is permanently bent due to an old injury, hence all the wrinkles). My fitting issues seem to have moved from the front to the back, where excess fabric is bunched up behind my arms. It's not the end of the world, but I think it could look better. I spent the rest of an afternoon trying to work it out. This is version 2.1. I took out 1/4" from the back armscye. I'm way out of my depth here, but this is looking better to me. I still have room to move, and more importantly, I haven't screwed up the front. Sometimes I feel that I fix one thing only to f$&@ up something else. Have you been there? These are details of Version 2.2. I think I've removed 1/4" from both the back armscye and the under sleeve. It's easy to loose track of what I'm doing. I've changed my shirt with each adjustment so I can keep them straight. I'm not a fitting expert, so I'm just going with what I think will work. Also, I haven't physically trimmed anything. I'm just taking in what I think is excess fabric and basting a new stitching line. Lastly here is version 2.3, where I think I pulled the jacket side up 1/4" at the underarm. I can honestly say I'm at the end of my rope with fitting at this point. I wish I had the persistence of Michael over at Line of Selvedge, a guy who can work through muslin after muslin after muslin. Sadly, I don't have that patience. I'm burning out here. Fast. This is, after all, just a bedsheet. I'm going to let the dust settle and read your suggestions, which are always so helpful. In the meantime I'll work on the boat; one project where I'm actually making some progress! 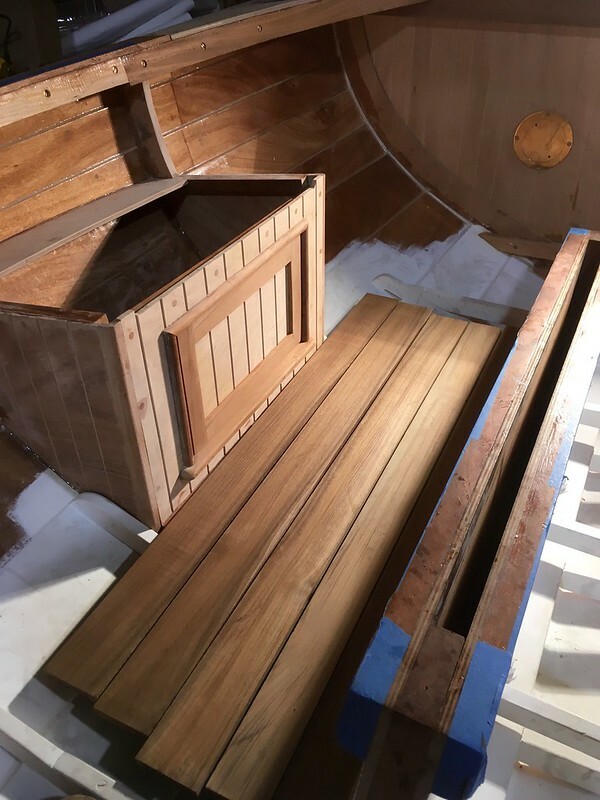 I've built in little side storage lockers (room for a life vest and lunch), and I'm preparing to install teak floor boards. Finally a level surface to stand on! I hope all your projects, sewing and otherwise, are going well. Cheers!